Last year my husband and I started a bible study group with absolutely NO experience. I hadn't ever been part of a group before, but God was tugging on my heart so we jumped in head first. We learned so many lessons, what worked and what didn't work in our first year. 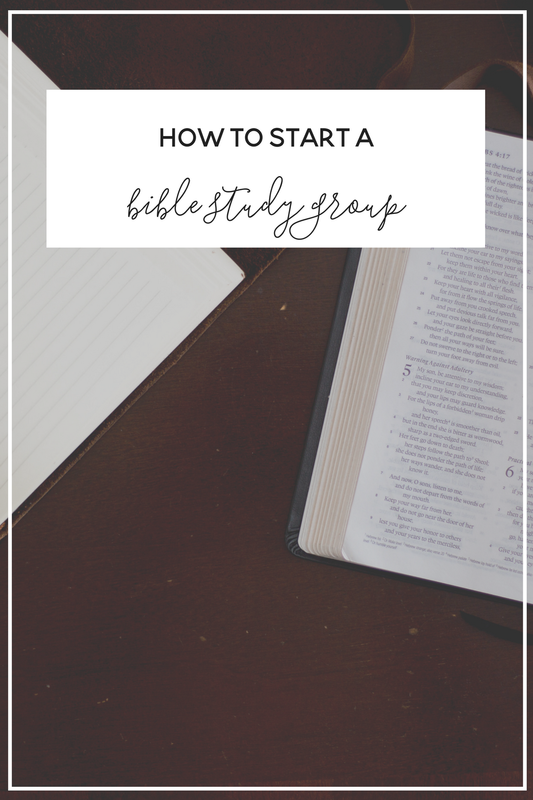 Today I'm going to share what we learned during the process and give you some ideas for how you can start your own small group. We were lucky that our church already has an online program to help people start and join study groups. Late last year they actually started an entire program for Home Groups and we signed up to be leaders. If your church doesn't offer a program to start or join groups, no worries! You can easily grow your group through friends or with neighbors. We'll just start with the basics. The great thing about starting your own group is that you get to pick the details. Where you meet doesn't really matter as much as you think. We live in a tiny 700 sq. ft. apartment so when we started our group we just met at a local coffee shop. Later we realized packing everyone into our tiny living room was actually fun and helped us feel a little more comfortable with each other. Do whatever works for you, you can always change this up as needed. Just make sure you're giving said local coffee shop a heads up if 20 people are going to be meeting in their lobby once per week. Another perk to starting your own group, you get to pick the time. For us, Tuesday nights at 6 pm worked well, but we started at 7 pm, then 8 pm, back to 7:30 pm and now at 6. The time can be flexible and you might change it as your group evolves. For now, just pick a night (or morning) that works for you and will most likely work for the members you hope to recruit. For example, 6 am on a Saturday probably won't sound ideal if you're trying to get local college kids to join you. We planned for our group to take 1 - 2 hours and that's been a perfect time frame for our group. Just make sure you let your members know the time and date early on and make sure they understand the commitment and expectations of these times. This is the harder part. You have a time and place, but what do you do now? Figuring out what to study can be tough. We have a group of people who all attend the same church as us, and our church provided study questions online, so we used those for a long time. For a while, we just picked a book in the bible and read through it together and discussed the reading each week. You can find free Bible studies and commentaries online, but we really liked the She & He reads truth studies to base our reading off. Now that our church has started a home group program, they provide us with study material to talk about in our groups. Whatever content you use, just know that as long as you're reading, praying and talking, it will be a good conversation. (See more resources at the end of this post for some good studies to start with). Once you have the basics (time, date, place, and study) sorted out, it's time to find your people. I highly recommend reaching out to people in your church first. Since they will generally have the same Christian beliefs as you and they are already familiar with the community. You can also ask friends, family, neighbors or coworkers. We've found 6-16 people is a great group size, but we know groups who have had 50+ people! Whatever is comfortable for you is great. What we do recommend is to have an "enrollment period" where new people can join your group, and then close it off for a season. We work in Fall and Spring semesters and take off weeks like Christmas, Thanksgiving, Spring Break and Summer to allow a little break. Building a system that works like this allows you to spend 6-10 weeks at a time with the same people (no new people joining in) and that way you can get to know everyone well and dive into some of the deeper stuff that you might not feel comfortable sharing with a total stranger. We were really nervous when we started that we wouldn't be able to find any people to join our group, but I knew this was a God-thing when we had 10 people in just a couple weeks. If you're having a hard time finding people, pray about it! Even if it's you plus two others, study together! You don't need to start a revolution to grow in your faith. God will provide, just make sure you're getting out there and inviting. The whole point of starting a group is to study together! But at times, figuring out the rhythm of the group can be awkward. You might find that watching a video together and talking about it after is a good format. Or maybe you all read a passage during the week, then talk about it at group. Finding a format that works for your group will take some time, so make sure you try a couple different methods and get feedback from the other members. Ask what kind of format they prefer, ask if anyone has feedback on the format you've been using. Most of all, pray through these decisions (as a group and on your own). You might not find a format that everyone loves, but finding something is better than jumping around for a year. We found reading passages beforehand and then going through discussion questions during our meeting is a format that we all love. It feels less like a planned meeting and more like friends having some deep conversations. Before and after each meeting, say a quick prayer with your group members. If you're not comfortable praying, you could ask someone else to pray. We like to ask people if they have any prayer requests at the end of the meeting, and I try to always write them down so our members feel they are important and will be referenced later (plus I don't have the best memory so this helps me pray for them all week). It's great to get together and study the Bible, but it's just as important to form relationships with your group. Plan a night to go out to dinner, or have a girls/guys night. Go on camping trips, mission trips or to church services together. Volunteer together. Acts 2:44-47 paints a beautiful picture of what church should really look like. A church isn't just a building and Sunday sermons. The church is a body of believers, doing life together, loving people well, serving each other, praying together and devoting themselves to building community. As important as the Bible is, building community with your people is what makes God's word real. It's what changes hearts and heals brokenness. Our group has a group facebook page where we can post prayer requests, plan dinners, check in with each other and just be connected through the week. You might prefer a text group or a slack channel or maybe you're meeting every day. Either way, find some simple method for keeping in touch with each other. When our church launched their home group program, they gave all the group leaders The Essential Guide for Small Group Leaders, and honestly, it is the most helpful book I have ever read about starting a small group. There are chapters on how to recruit new members, how to handle no-shows, icebreakers for new groups, how to address challenges in your group and how to lead great discussions. If you're starting a group, this is the one resource I'd point you toward. Bible App Reading Plans - This completely free app works on your phone or desktop. You can even read it as a group and see comments from your group members and track your progress. SheReadsTruth - They have bible studies for sale, or you can follow along for free on their site. Their studies are great for beginners and some of them (Proverbs) have study questions as well. BlueLetterBible - This is a great reference for digging into passages or finding commentaries to assist your understanding. The Bible Project - If your group is studying by book, these videos are great for getting an overall picture of the story. Flatirons Young Adults - This is our church's program for Young Adults. If you're between 18-30 years old, these sermons are directed for you. They are monthly nights and what we base our discussion on as a group. This is a good place to start if you don't have a church home. Have you started a study group yet? What's holding you back? What questions can I answer to help you feel better about starting one? Let me know in the comments!